Have you ever walked through the rainforest and discovered a large empty snail shell? Well these shells belong to Hedleyella falconeri or the Giant Panda Snail. They are not called giant panda snails becasue they are black and white, it is becasue of their enormous size, about the size of a tennis ball. 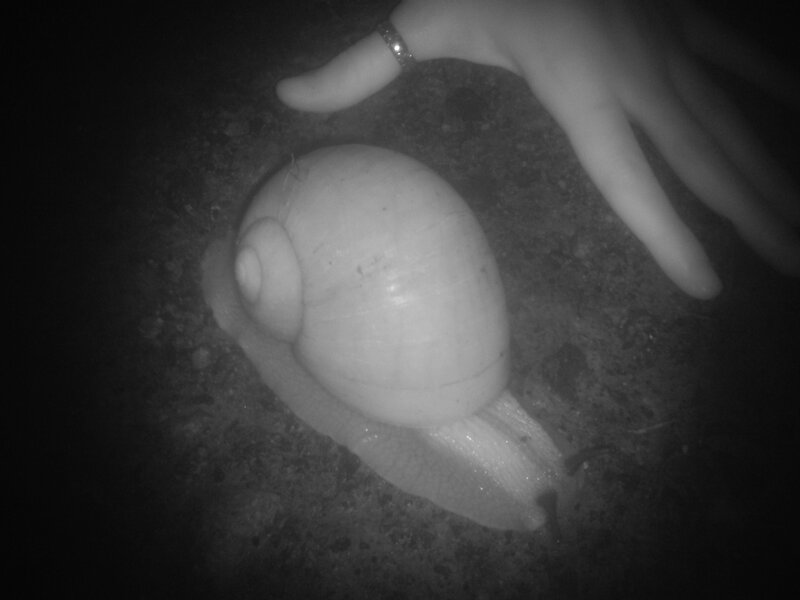 We usually see them on our Night Vision Walk any time between February and June, but these damp conditions have certainly brought them out of their shells (sorry). When people see them for the first time they simply can not believe the size. So impressive are they, people often say they are the best thing they’ve seen that night, despite also seeing pademelon, bandicoots, owls. Hedleyella falconeri are a nocturnal land snail, in fact Australia’s biggest land snail. Which can be found in sub-tropical rainforest where it forages in the leaf litter of the forest floor. Like other snails it is more active during and after rain to prevent water loss from its soft body. This species will shelter under tree roots and logs but also within the leaf litter in forest clearing. Giant Panda Snails are hermaphroditic, meaning that individuals possess both sperm and eggs. If you want to see these guys/girls in action, get out into the rainforest at night. But be careful, as they do react to torch light, you are best to observe them with night vision technology.